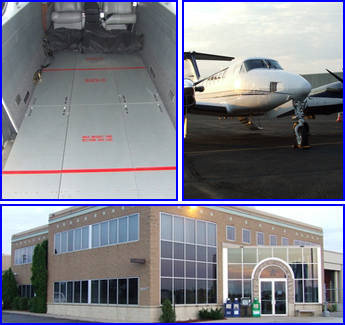 Get more value from your King Air aircraft. Aerospace Resources, Inc sells innovative quick-change systems to clients all over the world. These ingenious systems allow you to turn your passenger plane into a cargo plane in a matter of minutes. When the cargo mission is complete, you can turn it back into a passenger plane just as easily. We also offer aerospace engineering services and create custom modifications for clients. Our systems use space efficiently in order to provide you with the maximum capacity. Our King Air 90 Series equipment allows for more than 20 square feet of cargo space in the main cabin and our King Air 350/C-12 Series equipment has up 50 square feet of cargo area. Installing our quick-change equipment is easy. No tools are required, and a single person can easily install and remove the equipment. The complete installation takes less than five minutes once the standard cabin components have been removed. No permanent modifications are necessary, so the plane can easily be changed back to passenger configuration in just a few minutes, and the cargo system does not affect pressurization or other systems. All parts are PMA (parts manufacturer approved) and the system as a whole is covered by an STC (supplemental type certificate) from the FAA.